The inspiration of harmony, freshness and peace to the world. 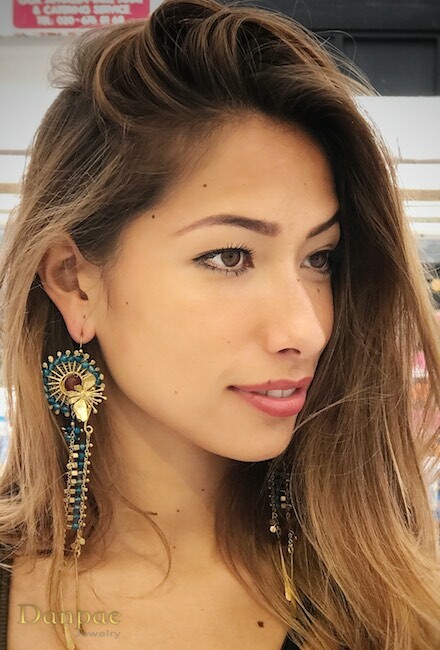 Handmade Art Earrings design in brass. Decorated with Aventurine and Moss Agate stone. The imagination of the goddess who is surrounding with abundance of nature, colorful blossoms, fertility and dragonflies. She is represented as a magical beautiful lady. Handcrafted Art Necklace design in brass decorated with Chalcedony, labradorite, Amethyst, Fluorite, Aventurine, Carnelian, Garnet and Semi Precious stones. This necklace is represented the wisdom on earth. We can let our mind flow as water. Colorful bule sky allow us to touch the heaven. A flower’s fragrance declares to all the love in the world. Handcrafted Art Necklace designs in brass. Decorated with Chalcedony ,Fluorite, Carnelian, Rose Quartz and Semi Precious stones. The mysterious power that brings your inner and outer beauty out is now available for you! When you choose for Danpae Jewelry, you choose to emphasize your character and determine your identity. This vigor of Danpae handmade jewelry just defines who you are! 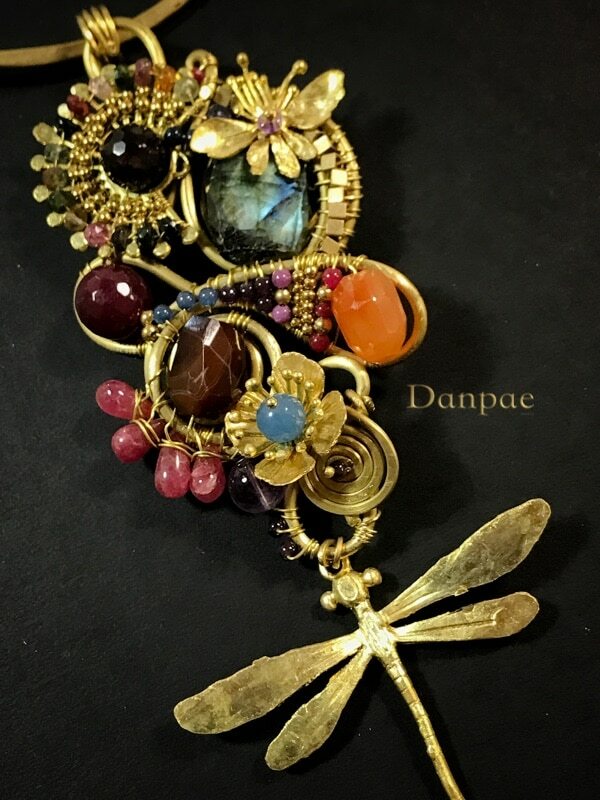 Danpae jewelry is made with love and passion and refined craftsmanship with an origin of ancient heritage. Tradition and modernity come together in this uniquely designed handmade jewelry. Just mix and match! 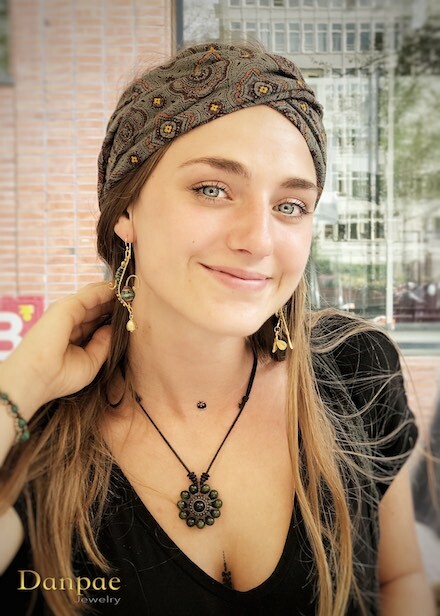 By transforming thoughts into reality and bringing projects into action the jewelry is designed then physically made by working with skilled Craftsmen and Artisans. 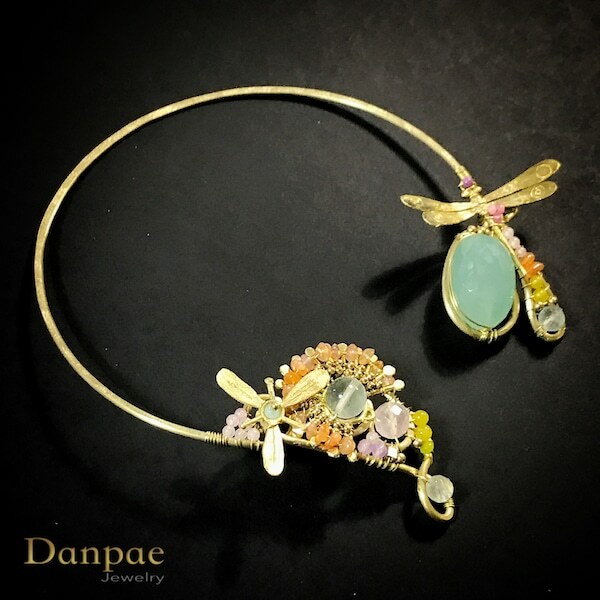 Danpae designs are full of colorful blossoms, butterflies, dragonflies and a variety of adorable insects/animals. In many cultures the butterfly and dragonfly are recognised as a symbol of luck. Fairy Tales and Princess images are behind the major part of our design styles. I want to bring the “Game Of Thrones” to life for my clients. Wearing my exclusive jewelry, my clients will feel like they are reigning over their own very special Fairy Land. Innovative design is key to my modern fashion statement, made specially for my sophisticated clients. Our jewelry is inspired by the beauty of nature that Mother Earth gives us, therefore we use a lot remarkable natural materials. My goal of creating unique and exclusively handmade art piece jewelry is to accentuate each woman’s individual natural beauty. Even if you don’t wear the jewelry all the time you will always feel special just knowing you have such a finely-crafted piece ready to wear when you possess them. There can be a Miracle appearing everyday in our life, it is the way we interpret our days. There is beauty everywhere. It depends on how we look at things and how grateful we are. Everyone can touch Heaven. It is here, on Earth! If us, ladies, are flowers, then Kate, your jewelry is the water and sun that we need to bloom and blossom! Earrings arrived in perfect condition! Even more beautiful then I expected. Thanks so much for your quick service and hope to meet you in amsterdam in the very near future! I was wearing my Danpae piece yesterday and had SO many compliments! Thank you for your creative mind and hands! 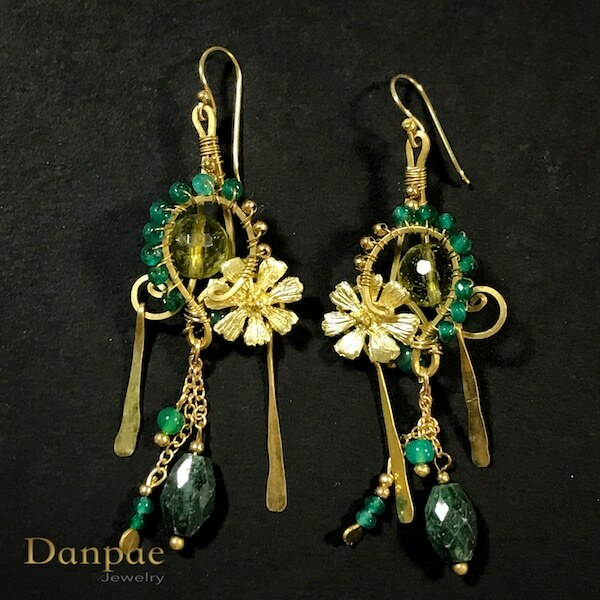 Danpae Jewelry is handmade design in brass and decorated with different natural materials such as; crystals and semi precious gemstone. They are attractively priced, unique; timeless and good quality. Do you ship outside Europe? Do you also provide jewelry parties? Yes, if you want to celebrate a special occasion or just wish to have a great evening with your friends than yes we do! Want to know how it works? Feel free to contact us.